Peter of Moderne Burger sent me the same photos that Andrew posted on UrbanDiner and I have posted them to flickr to further publicize the re-opening. 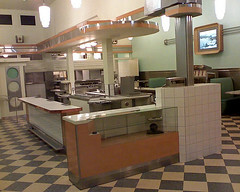 Check out Peter's Moderne Burger Sneak Peek Photos on flickr. And see you at Moderne Burger (we hope to make it out there Saturday night fingers crossed! ).